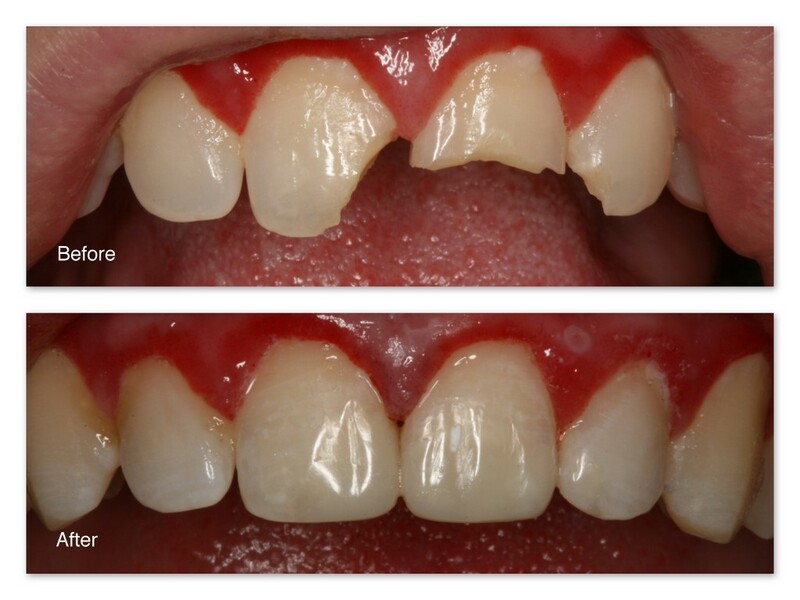 Before– This patient fell and broke three of his front teeth. After– Comfortably, without the need for anesthetic, and in one appointment, Dr. Jack Hosner of Portage, MI bonded tooth colored composite resin material to the teeth to recreate what had been lost. This picture was taken immediately after treatment. Before– This patient has a broken old porcelain crown. Notice the monochromatic “dull” appearance of the crown. 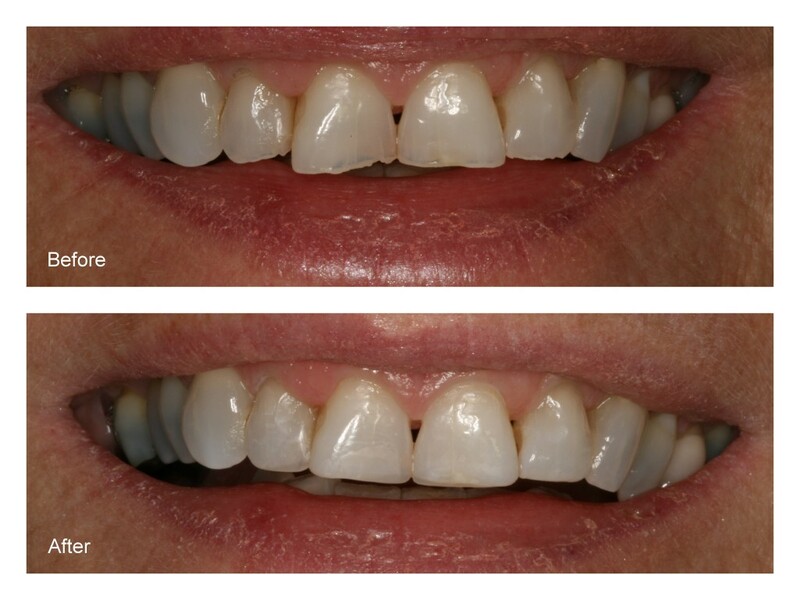 After– Dr. Jack Hosner of Portage, MI replaced this crown with a more natural appearing porcelain crown. Notice how it has multiple colors to it and doesn’t look dull. Before– This young 10 year old boy broke his tooth while playing. 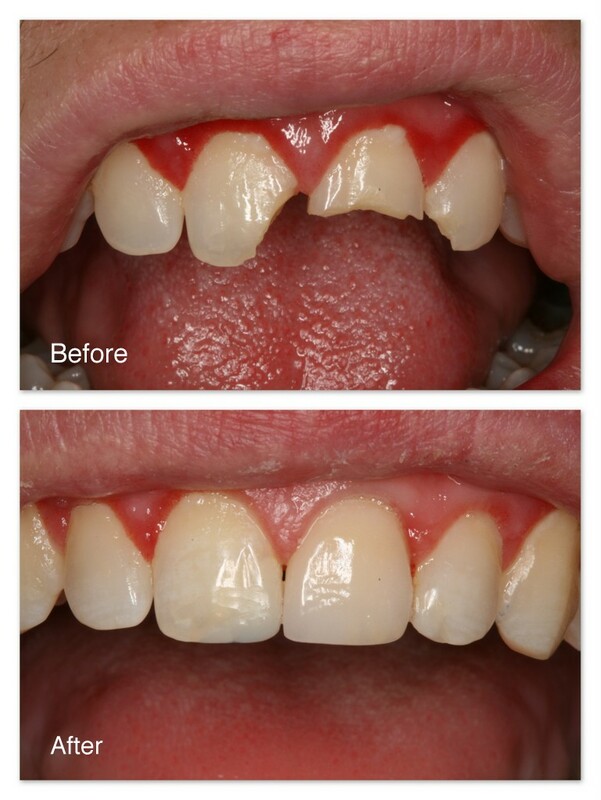 After– Dr. Jack Hosner of Portage, MI bonded tooth colored dental material to the tooth to restore natural shape. Before– This patient broke his two front teeth. 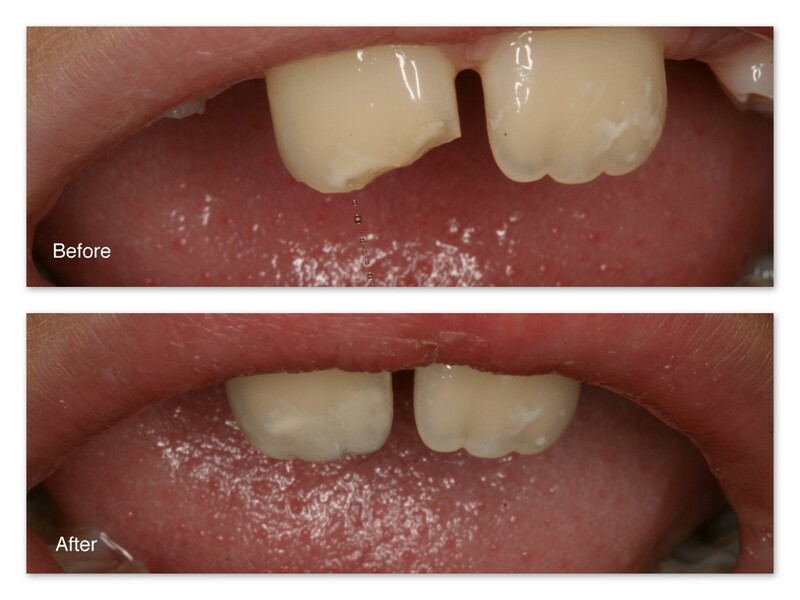 After– Dr. Jack Hosner of Portage, MI bonded a porcelain crown onto this tooth to restore natural form. Before– This patient broke her upper front tooth. 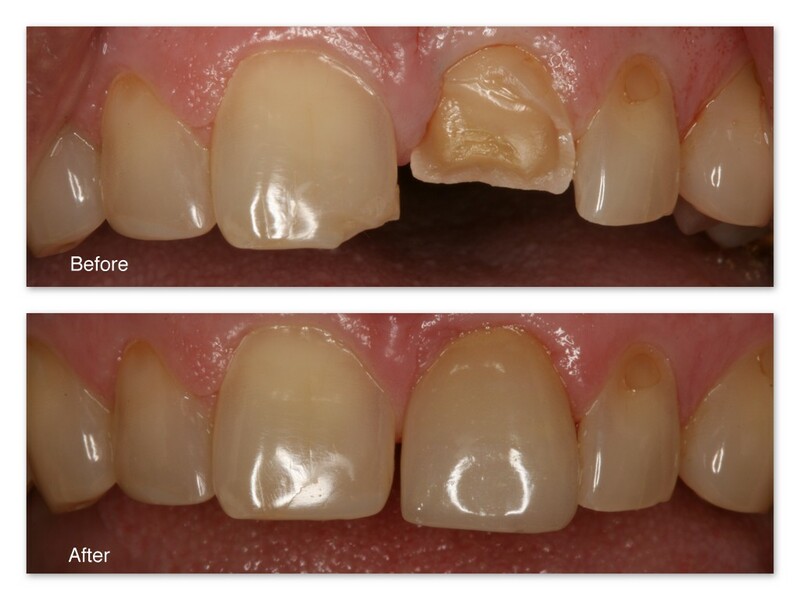 After– Dr. Jack Hosner of Portage, MI bonded tooth colored dental material to restore tooth back to normal. No pain. Numbing not necessary. Before– This sixteen year old patient of Dr. Jack Hosner’s fell and fractured her two front teeth. The tooth on the left is fractured into the nerve thus requiring root canal therapy. After– This photo was taken right after treatment – the same day she came in. Dr. Jack Hosner of Portage, MI performed root canal therapy on the tooth on the left and bonded the patient’s own broken tooth pieces back onto her teeth. * Note, the broken, reattached pieces are dehydrated from being left out of the mouth for an extended period of time, and this is why they appear whiter than the tooth structure that did not break out of the mouth. After 4-6 hours, the patient’s own saliva will rehydrate the tooth structure back to its original color. Before– This patient fell and fractured his upper front two teeth. 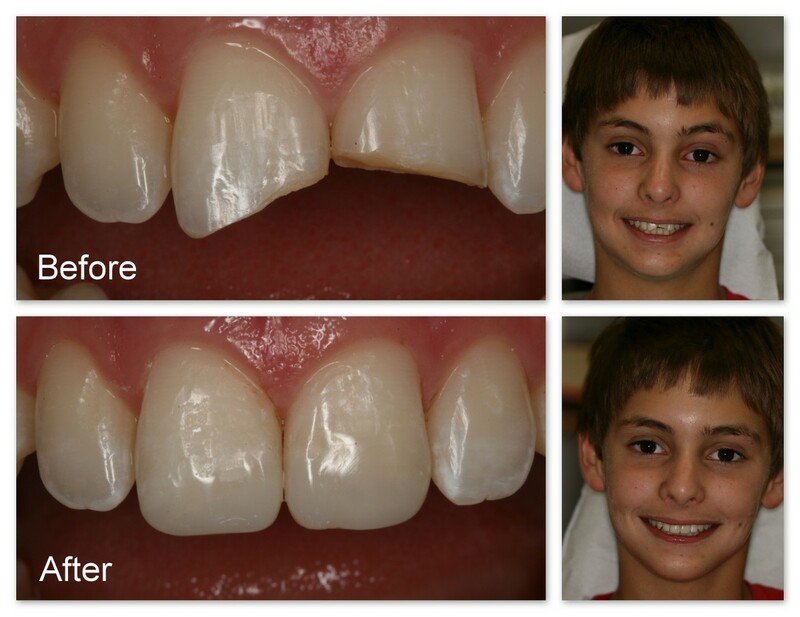 After– Dr. Jack Hosner of Portage, MI restored these teeth with bonded composite resin. Before– Same patient as above fell again fracturing his teeth even worse than before. 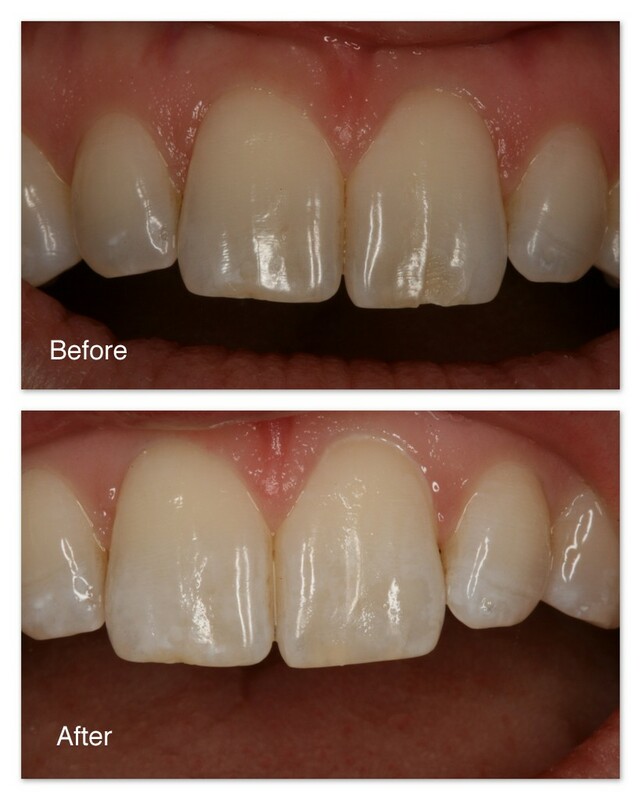 After– They were restored back to natural appearance with bonded composite resin by Dr. Jack Hosner. Before– This young man broke his two front teeth and could not find the broken pieces. Before– This young man broke his two front teeth and could not find the broken pieces. After– Composite resin was bonded directly to his teeth by Dr. Jack Hosner of Portage, MI to restore the natural appearance. Before– This is a close-up of the same patient showing the broken teeth. After– The artificial, tooth colored composite resin bonded to the teeth and polished by Dr. Jack Hosner of Portage, MI. Before– A patient of Dr. Jack Hosner’s from Portage ,MI presented with a chipped upper tooth. 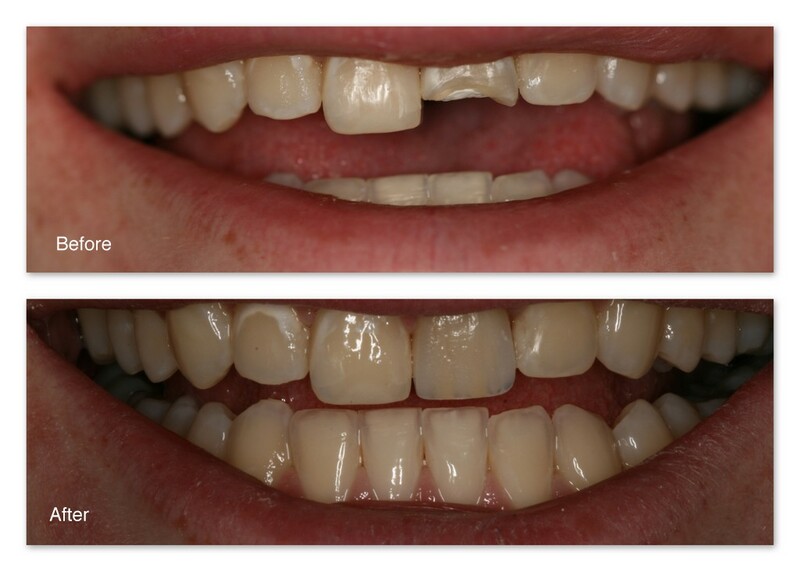 After– Composite resin was bonded to restore natural appearance. Before– This patient fractured his tooth. 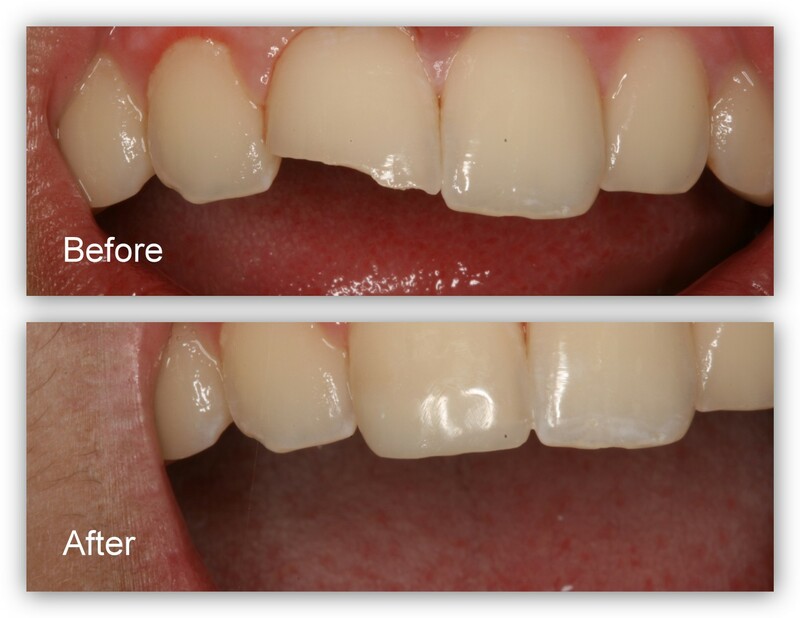 After– Dr. Jack Hosner of Portage, MI repaired the tooth with bonded tooth colored composite. 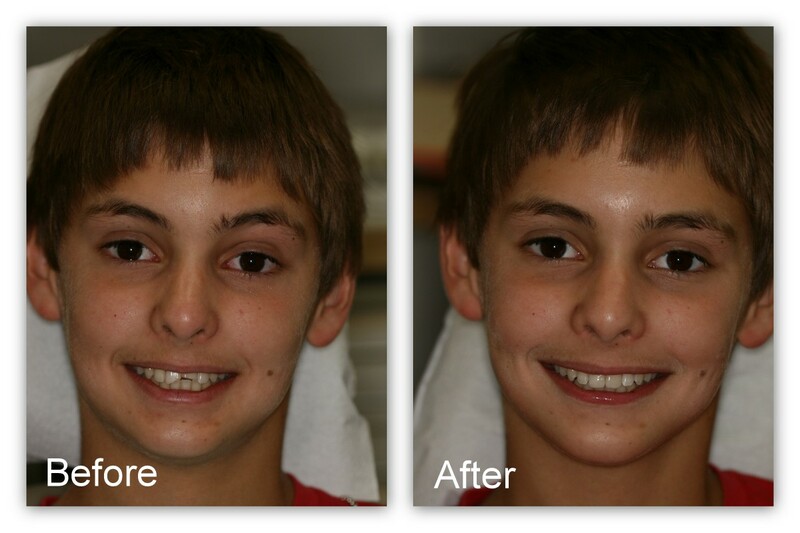 Before– This young man broke his two front teeth and was able to locate the broken pieces. 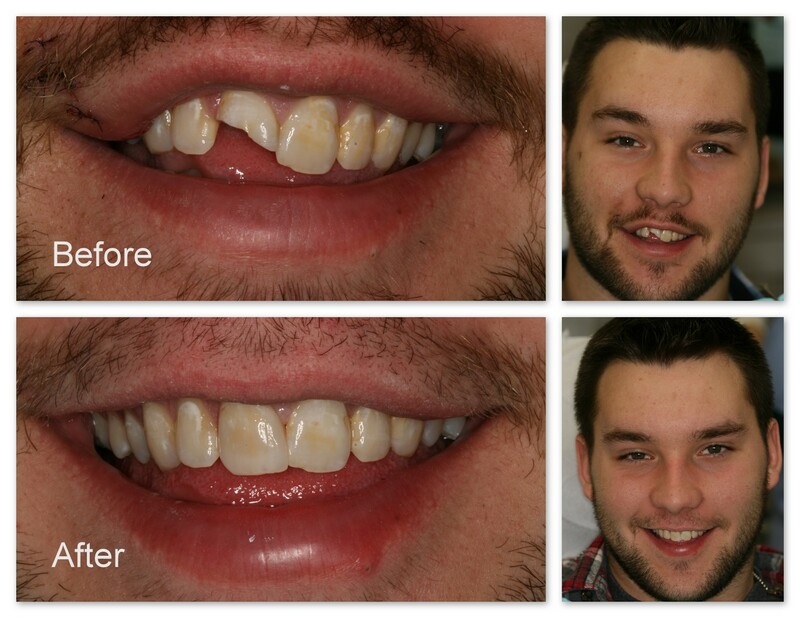 After– Dr. Jack Hosner of Portage, MI bonded the broken pieces back onto the two front teeth. Note that the color of the broken reattached tooth pieces are lighter in color. This is because these pieces were left out of the mouth for awhile and became dehydrated. After 4 to 6 hours, the patient’s own saliva will rehydrate these pieces back to their original color. Before– A work accident caused the fracture of this patient’s front tooth. The fractured piece could not be found. After– Dr. Jack Hosner of Portage, MI placed a porcelain crown over the fractured tooth to restore proper contour and color as well as to protect the tooth from further fracture. Before– Close-up of fractured tooth. After– Close-up of new porcelain crown. Notice all the color detail in this crown to make it look like a natural tooth. 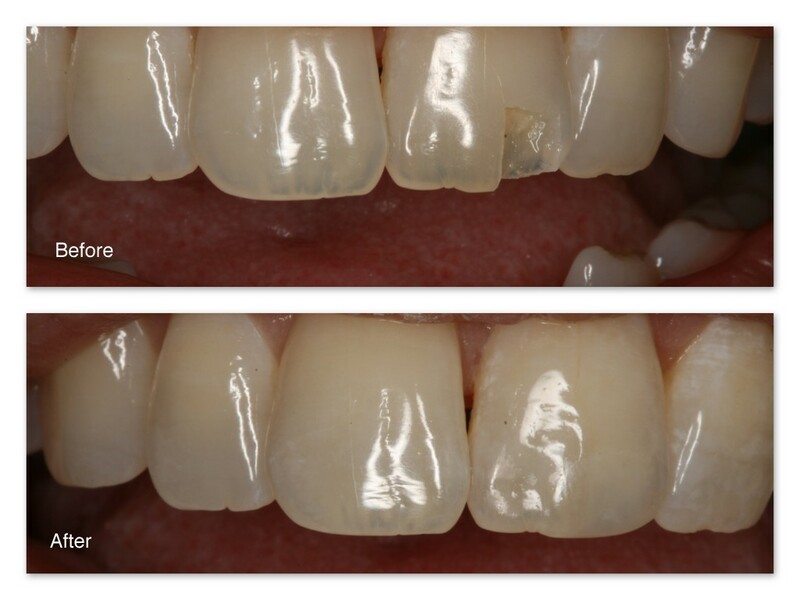 After– Dr. Jack Hosner of Portage, MI restored this tooth with an all porcelain crown. Notice how much more natural this crown looks vs. the whiter opaque crown on the right side of the two front teeth which is a porcelain fused to metal crown. 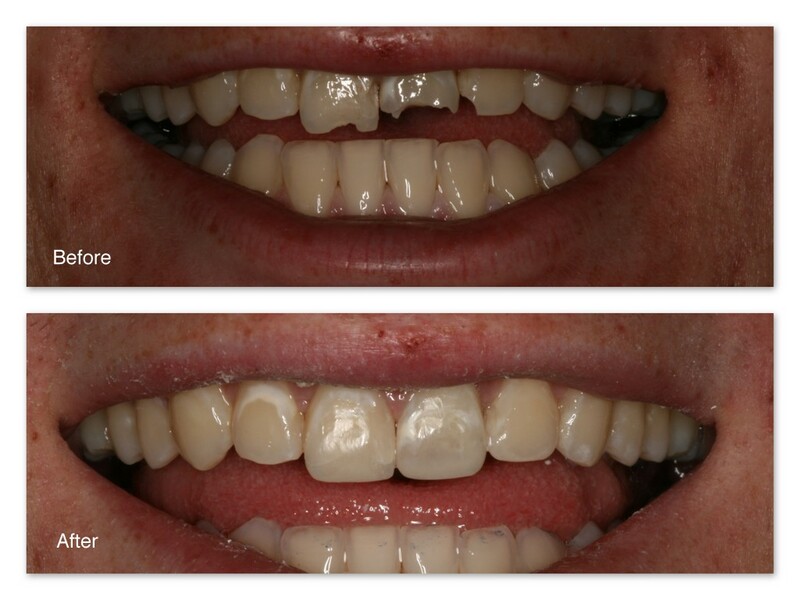 After– Porcelain crowns were placed by Dr. Jack Hosner of Portage, MI. Before– Big area of tooth missing. After– Composite resin tooth colored material was bonded to the defect, contoured and polished to resemble a natural tooth shape by Dr. Jack Hosner of Portage, MI. Before– This patient fractured his front tooth. 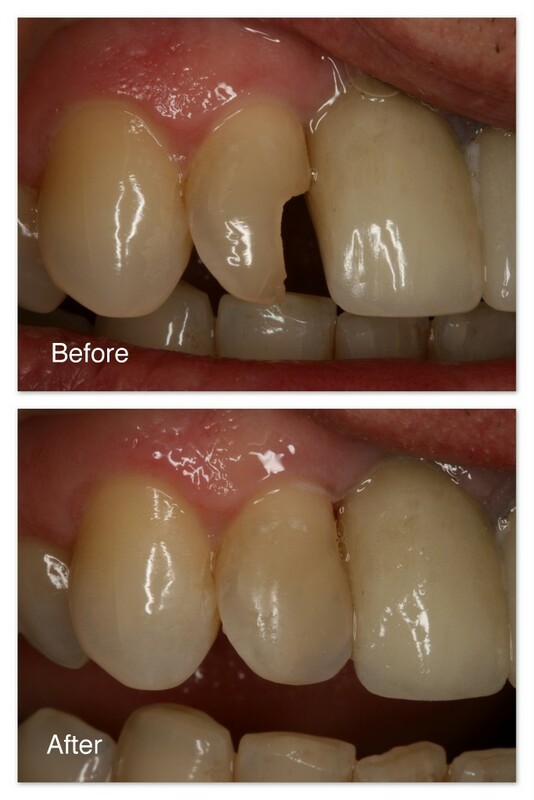 After– Dr. Jack Hosner of Portage, MI bonded a porcelain crown onto this tooth. Before– This patient chipped her front tooth by accidentally biting on a fork. After– Tooth was repaired comfortably, without anesthesia with bonded and polished material by Dr. Jack Hosner of Portage, MI. Before– Broken two front teeth. 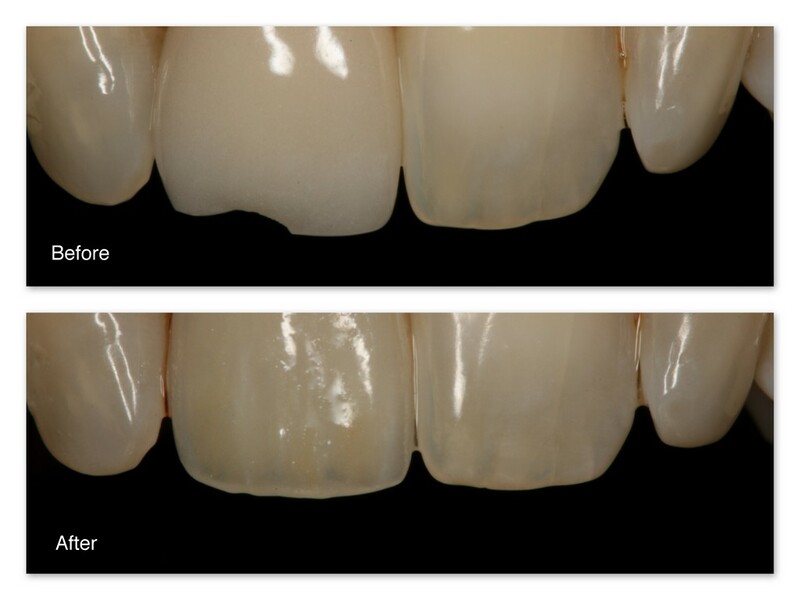 After– Tooth colored restorative material was bonded and polished to the left tooth. The tooth on the right required a full porcelain crown. Dr. Jack Hosner of Portage, MI delivered all of this treatment. Before– Small chips on upper front teeth. 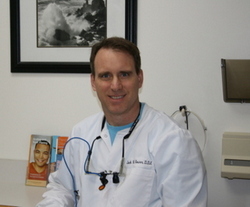 After– Dr. Jack Hosner of Portage, MI bonded tooth colored fillings to restore natural appearance.